Is the tool for admins to get the feedback from their users. 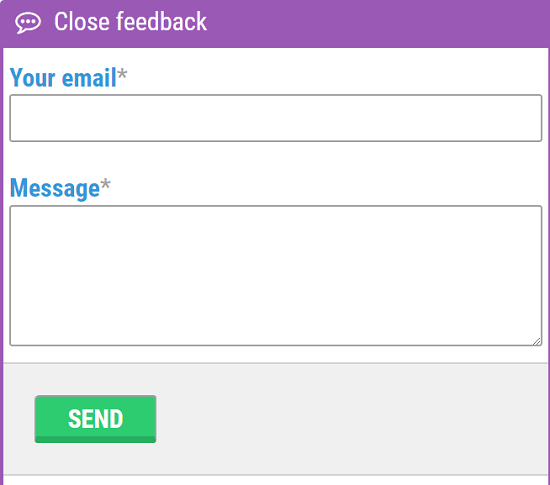 As there are very often some questions about the use of the platform or how to study the content, Send Feedback allows every user, even not logged in to send the question, issue he has or just the description of the situation he is facing. The tool is just a box placed in the page right bottom. To proceed the feedback, click Send. The Send feedback box may be also closed by clinking the header text Close feedback. LMS platform admin (all users that has role admin) will receive the email message with the user contact and description he has provided. Based you the information you are able to reply, navigate him and provide the support.